MANABI, ECUADOR – While recently fighting a three-week perpetual cough, I lost my normally-healthy appetite. The past few days have found my strength returning, and my taste buds are suddenly screaming for attention! Jake’s Sunday Post has given me a great opportunity to tease my appetite back to normal! Viche – Not to be confused with Ceviche! 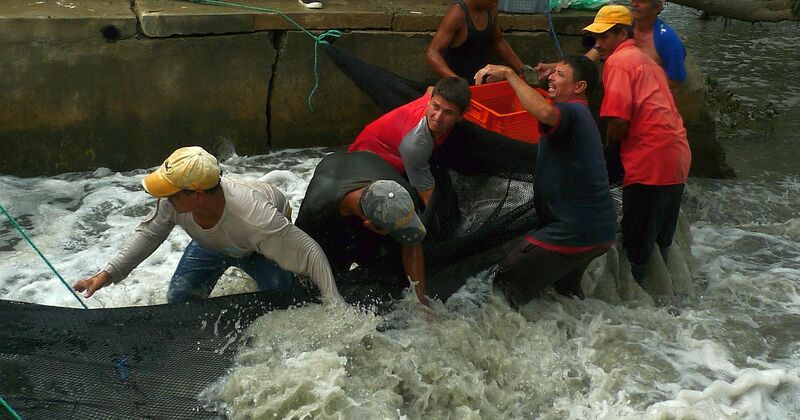 The province of Manabi Ecuador is known for its culinary specialties. Viche, sometimes spelled, Biche, soothes the palate with a pureed peanut based fish and lemon juice stock. Packed with fresh in-season vegetables, shrimp and/or fish, viche also comes with green-plantain ”balls” that patiently wait to be discovered at the bottom of the bowl! The customary garnish of cilantro adds color and flavor! Almost always, fresh lemon juice and aji (hot sauce) are served on the side. Upgraded from bicycle to moto, this friend peddles the fresh-fish of the day! 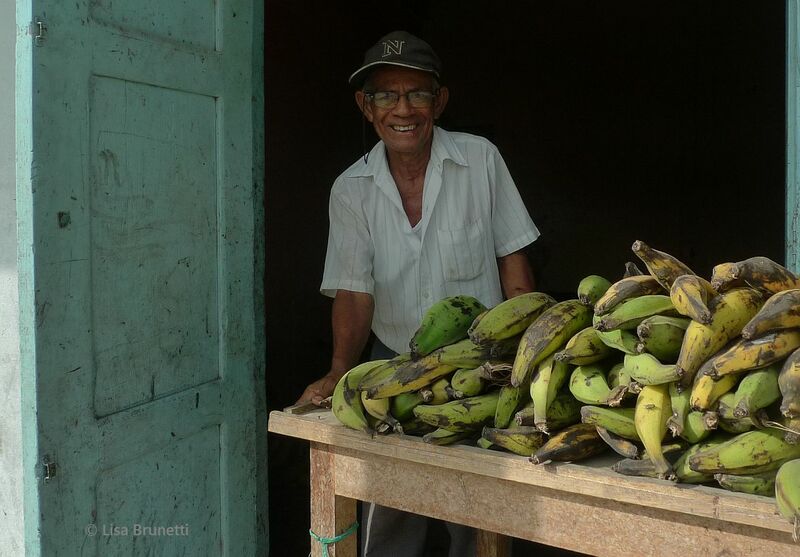 Many people associate breakfast and coffee in Manabi with a specialty called, “Bolones.” Bolones are the hush puppies of green plantains! 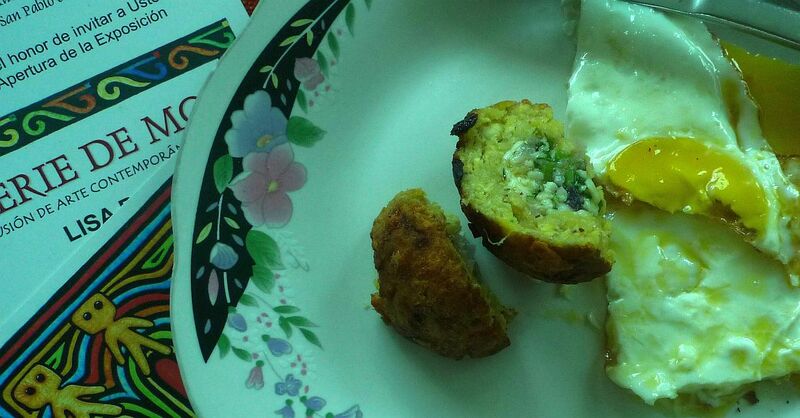 Two options are usually offered, the soft bolon and the crispy fried ones. My favorites are fried, just like a Southern-fried hush puppy! Often stuffed with fresh queso blanco, they are traditionally served with coffee. Not quite as thick as viche, but every bit as delicious is encebollado. Lots of finely-sliced onions and a generous dollop of fresh tuna makes this an excellent choice for a hearty brunch! On weekends, sidewalk restaurants spring up in random locations, and one learns by word of mouth where to find the most-popular stations! 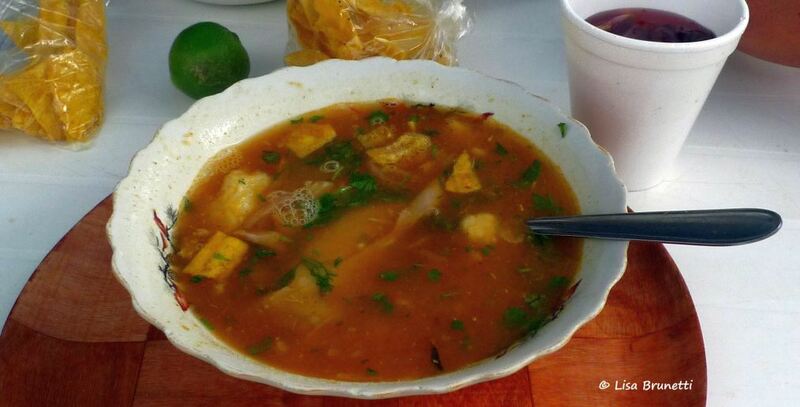 Reported to cure the morning-after hangover, encebollado is often served with a cold cervesa as well! I arrived in town too late this morning to feast on encebollado. One can usually find an tasty ‘Blue-Plate Special” alternative at any of the local restaurants. With a first course of soup, main course and a small serving of juice, the lunch almuerzos usually cost between two and three dollars. 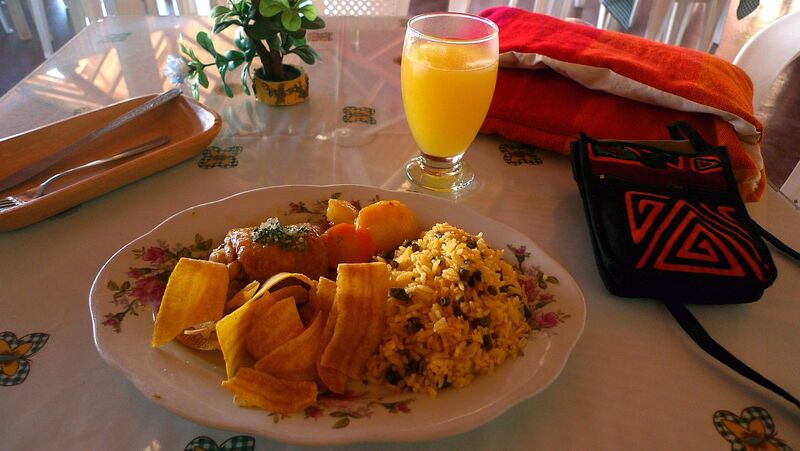 Pollo with potatoes and carrots, rice with finely-minced green beans, chifles (friend green plantain strips) – and fresh juice! Many times popcorn is served on the side when the soup course arrives. Watching my fellow-Ecuadorians dump their popcorn into the soup, I quickly adapted to their example. One day while dining with my attorney, I dumped the popcorn then paused, adjusted my relaxed table manners, and asked, “Is what I just did considered proper table etiquette?” He smiled and said that normally one would not do that, but it’s a widely-accepted custom. 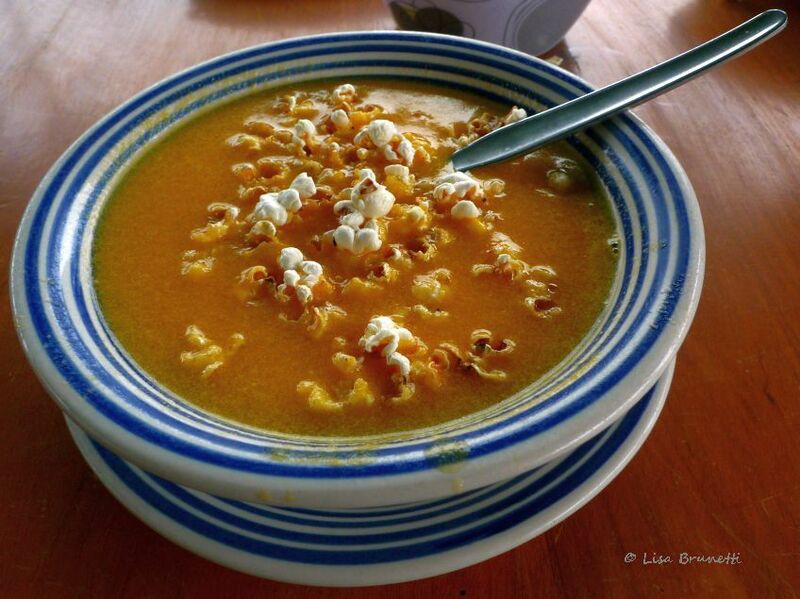 Dubbed ‘Popcorn Soup” by many extranjeros, it’s only the garnish that gives it the nickname. 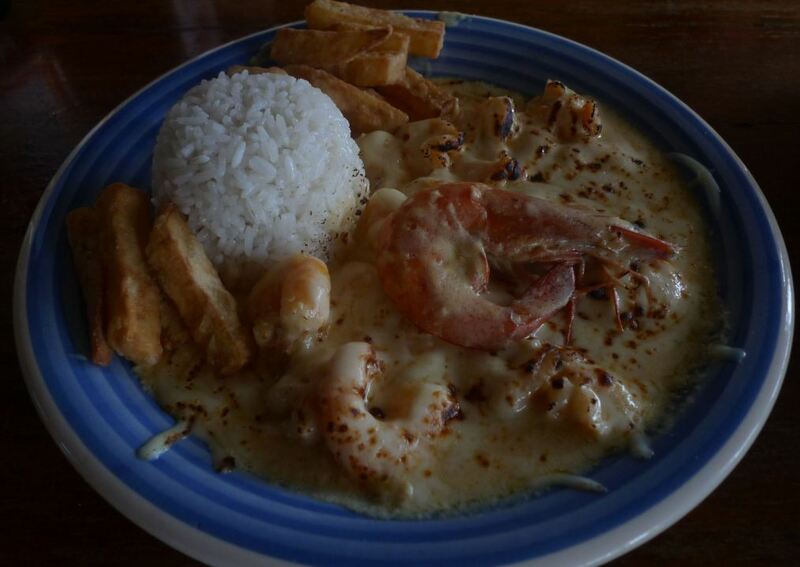 I negate all of my healthy eating when I splurge on Motumbo’s Seafood Special in Cruzita! It’s worth every gram of fat! When one decides to bust the budget and splurge, oh my, the options are amazing! My friends Laura and Barb all but overdosed on shrimp and lobster when they visited in May and June of this year! Recently friends have shared a baked dish called ‘Torta de Pescado.” I confess that I was not impressed with its name or how it looked when it entered the oven. Being the compliant Southern transplant, I politely sampled the finished product. 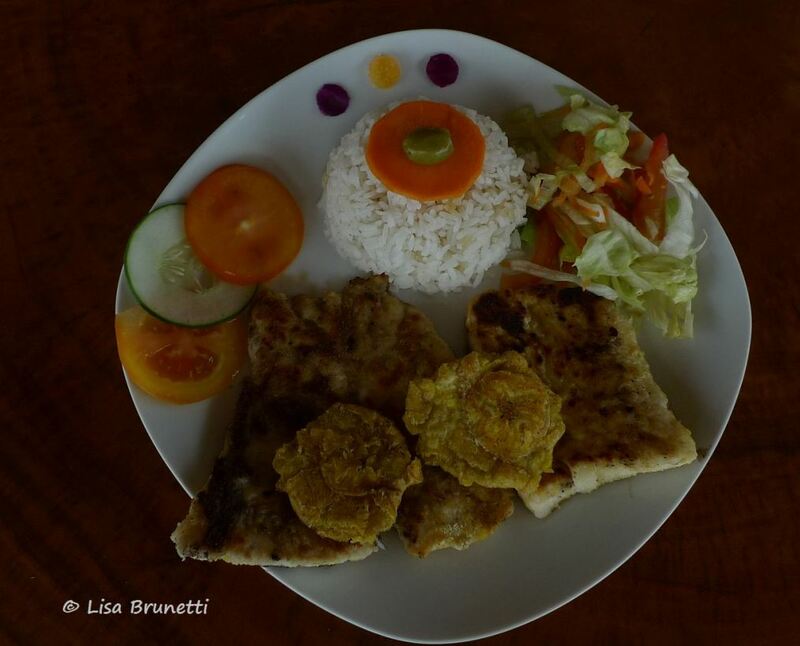 Oh my goodness, Torta de Pescado, a green-plantain casserole of a dish, is an amazing culinary discovery! I continue to be amazed at the versatility of green plantains! Papelito’s Corner Plantains – Jama, Ecuador. After four years, he recently informed me that his real name is Walter! The above information comes from the grueling demands of field research! 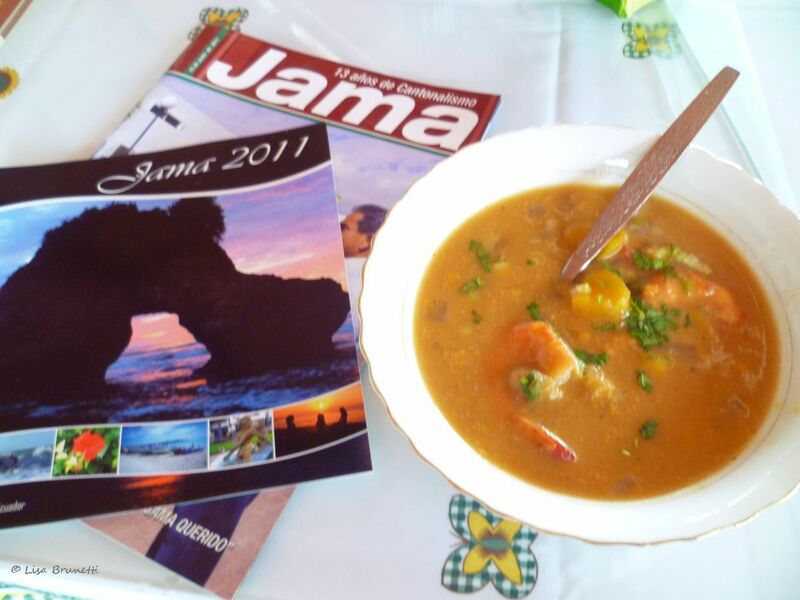 I welcome any comments, corrections or trivia that clarifies details about Manabi cuisine! For more worldwide DELICIOUS images, visit Jake’s Printers Sunday Post. Working on this post has left me HUNGRY for delicious food! Where shall I start? Which Manabi specialty looks most tempting to you? Hey amigos! Welcome back! I am sure we’re about to be blessed with some great new posts about your trip down the coast! Oh, what wonderful dishes. 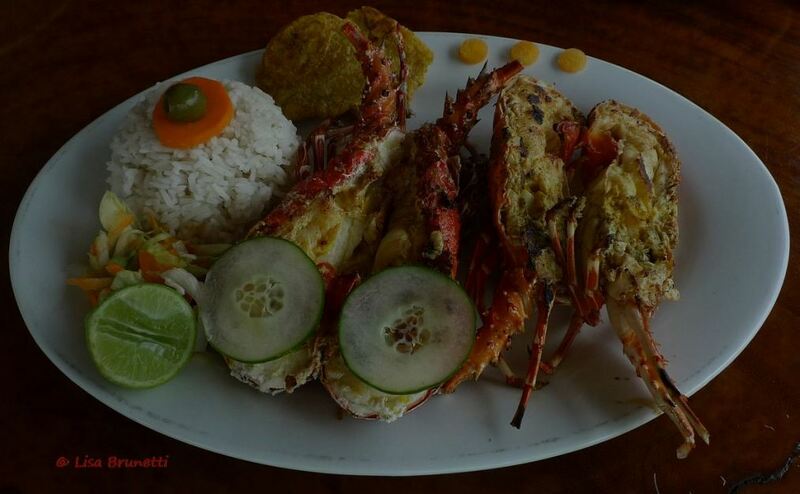 Motumbo’s seafood special would be my starting point – where I ended would be completely dependent on what was closest at hand. It all looks marvelous! The Bolones look great, too – tropical hush puppies? Who knew?! “Tropical Hush Puppies” is the best description for now. I need to attempt my own variation and see what happens! 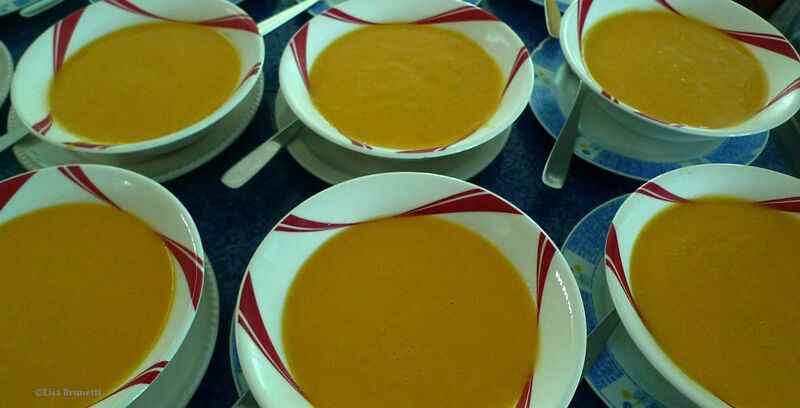 The creamy carrot soup looks inviting. I LOVE soup. But, seafood, ahhhh, now that’s nice! Thank you so much for taking the time to comment. I’m heading to your site now! The seafood combo! Lots of use of plantain! Have not eaten that. Does it taste like banana? a ripe plantain is sweet like a banana but doesn”t fall part.. they are often sliced in long horizontal strips and cooked on a griddle and garnish the plate with a touch of sweetness. i always save it for last! the green plantains are starchy and are used more like a potato substitute (but we have an abundance of papas)… they are firm like a potato and are sliced or grated or boiled and then mashed. the green ones have no hint of banana flavor. We rarely see these in our stores. How do you know when one is ripe and ready to use? I have a friend who says that he lets the ripe ones all but rot before they’re cooked! the older they get with more black than gold, the sweeter they are! as for the green ones, i am no expert! i assume any of them that are green will work. when they start turning yellow they still have a lot of starch and aren’t too sweet. i will try to photograph all stages the next time i am in town! Delicioso! I love the green plantains and the ripe sweet ones – and NY has plenty of them and it finds its way into my curries, stirfry, and fried sweet plantains, yummm! si, the plantains are so versatile, but aren’t those sweet ones delicious?!!! si, yummm! Wow, these are fabulous food photos! The viche looks and sounds delicious. And popcorn on soup–what a great idea! Glad to hear you’re feeling better! this is strange; i replied to your comment half an hour ago. i later restarted the computer, made some tea and returned to the computer.. it showed that your comment was in the trash, yet my reply to your comment was right there in the comment queue. go figure! yes, viche IS delicious! i usually pass on the soup course, because soup + the lunch special is usually too much food for me in the middle of the day. but when they have viche….. si, i turn it into a dining experience! today was my strongest yet. i worked outside until past dark, and i feel great! thanks! This is my kind of food. Would like to try the Encebollado. Sounds delicious. I’ve had the carrot and popcorn soup and plantains are plentiful here. buenos dias! yes, ecuadorian food is comforting and flavorful! do you cook with plantains often? yes, there are lots of tempting options here, and it’s always nice to have the soup option each day, especially on cool days. i’m cool this morning and wish i were in town so i could find an encebollado right about NOW! it’s 7 a.m.! hi, the colors are deliciously appetizing! I chose a healthy early option of a drink blend of papaya, banana, lemon mandarina, grapefruit then added it to hot ginger water — and it was quite lacking this morning!!!! encebollado or viche would make a much-better choice. i must be getting well, as my appetite is back in full force! since i don’t hve those choices this morning, maybe a poached egg and biscuits will be my next course! Ok now I want to hop on a plane and fly south! I love ethnic cuisine and these pictures are making me so hungry!!! ecuadorians are incredible cooks and so versatile! come on down!!!! It is good to know you are on the mend and the food looks amazing especially intrigued by the Encebollado. thanks! i think i am slightly addicted to encebollado. i’ve found that my friends either love it or dislike it. some ecuadorians have told me that they’ve never tried it. that’s fine’; therés more for me!!!! i feel much better- thanks! yes! it’s very common to be served popcorn on the side.. it usually arrives before the soup.. it’s amazing how much food one gets for a few dollars. thank you so much for your comment! wow, whooping cough! amazing. it probably made you a stronger person.. physically and spiritually by enduring difficult times. three months of nonstop coughint will make anyone lean – it’s so tiring. i lost my appetite, and nothing sounded appetizing. it must have been horrible for eating to affect your coughing. i credit massive doses of vitamin c – especially through the fresh grapefruit and lemon mandarina that are in season right now. i guzzled lots of home brewed ‘teas’ with ginger, mint, hibiscus and lemon mandarina.. plus a grapefruit about every four hours. this week it’s as if i was never sick. go figure. i hope to see the specialist in ten days, and hope he’ll help me stay well! Delicious indeed. Irresistible array of mouth-watering foods. It’s like a feast!!! i learned more about local recipes yesterday. it’s great to live where the common food tastes like gourmet food but is ultra cheap! ah, it’s the weekend; that means encebollado! 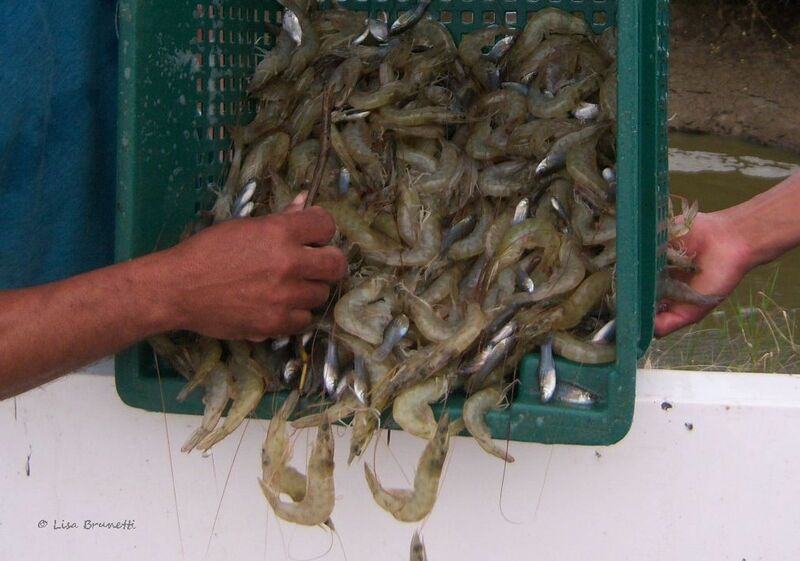 Who's The Boss on this Shrimp Farm? Spanish 101 - Please Pronounce "Santa Ana"